Buying gifts require a great deal of investment of time, thought and money. Even after that, there are chances that someone might end up not liking the gifts you buy for them. Thanks to the introduction of gift cards, gifting has now become easier. Now, whenever you are in doubt you can instantly buy vouchers online instead of spending hours hunting for a suitable gift. No matter what the occasion- birthdays, weddings, anniversaries, engagements, festivals, special days etc. ; you will easily find a plethora of eGift cards and eGift vouchers online alongside other gifting items. Presenting Zingoy, India’s best cashback and gift cards site! Here you will find a vast choice of eGift cards from over 500 stores and when you buy vouchers online via Zingoy, we give you some cashback on it. What’s more? Zingoy brings you some of the highest cashback rates on gift vouchers in the industry. Also, it gives you 10 days money-back guarantee in case the voucher you bought, do not work. How to Save Extra when You Buy eGift Vouchers Online via Zingoy? At Zingoy, we take saving seriously. So, when you buy gift voucher online from Zingoy, your saving does not just stop at the cashback that Zingoy gives you directly. Partnering with certain online wallets, Zingoy brings you some extra cashback to help you save more. All you have to do is use a particular online wallet to make the payment when you buy cards online via Zingoy. Zingoy brings you an exhaustive range of cards from over 500 brands as well as individuals. Yes, people, who have gift card vouchers that they do not need, can list them on Zingoy and earn money by selling them. Thus, the number of vouchers found on Zingoy is truly huge. Also, the eVouchers found here are from a wide variety of categories from fashion to finance. Be it a fashionista or a gadget geek, a new-born mother or newlyweds, a fitness freak or a college kid, you will find the right eGift card on Zingoy for every kind of friend or family you have. Apart from a gift card store, Zingoy is also a cashback website. Here you can also find all the latest offers and coupons currently live in various online stores. Also, during festivals like Diwali or New Year and special occasions like Valentine’s Day or Mother’s Day, you will find special vouchers offers from various brands as well as Zingoy. You can browse for all the latest gift offers from hundreds of stores across a variety of categories on this single page. If you are looking for any specific gift card offers, use the filters given on the left-hand side of the page. You can sort the eVoucher offers by store and by category. Just don’t forget to sign in and buy the gift cards online via Zingoy to earn the extra immediate cashback on it. Gift for Corporates: If you are looking to gift for employees, clients, co-workers, CEO then you can buy bulk corporate gift cards from the top brands like Amazon, Flipkart, BookMyShow, MakeMyTrip, Lifestyle, Shoppers Stop and more. Gift Vouchers for Birthday: Make a birthday celebration for your loved ones, friends or relatives super exciting by giving them eGift voucher as a surprise gift. Gift vouchers are best for the birthday as it brings a smile and also gives them a different choice of online shopping. 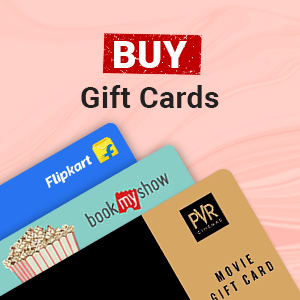 If you are looking to celebrate a birthday of your father, mother, brother sister than you can opt for birthday gift cards which will give them the freedom to shop from a wide range of categories like clothing, fashion, wallet, jewelry, mobile, and accessories. Wedding Vouchers: Want to give a surprise gift to a bride or groom than Zingoy offers you the eGifts cards from the top stores which you send as a special gift. These wedding gift cards are available on Zingoy at best price with cashback amount so you can buy and save more on every purchase. Anniversary Gift Vouchers: Celebrate your parents anniversary by gifting them anniversary gift cards. It is the simplest way to wish your parents and show them how much you love and care about them. Check out for the list of card option available on Zingoy on a different category. Gift Cards to him/her: Send wishes to your loved ones by sending Valentine Day gift offers from Zingoy. You can shop for some lovely gift from Archies, Amazon and more. Choose for the different voucher option available which may be an interest of your girlfriend, boyfriend, husband or wife. Food Vouchers: If you are looking for some celebration and planning for dinner at your favorite restaurant with your families or friends than you can shop all top food gift cards over here. Zingoy brings you the exclusive eVouchers from the top restaurants like KFC, Domino's, McDonald's, Pizza Hut and more top restaurants. Travel & Holiday Gift Vouchers: Make your friends or colleagues birthday super special by gifting them travel gift cards. It is the best gifting ideas that will help your friend to save his/her pocket. They are various types of holiday eGift vouchers available like MakeMyTrip, Cleartrip and more which are sure to bring a smile on anyone face. Gift Cards for Small Business Owners: If you are running a small business and wanted it to get boosted than gift voucher plays an important role for you. Make your customer happy by giving vouchers to them as an offer during special occasions this will help to build trust among the customer and can be a regular shopper.